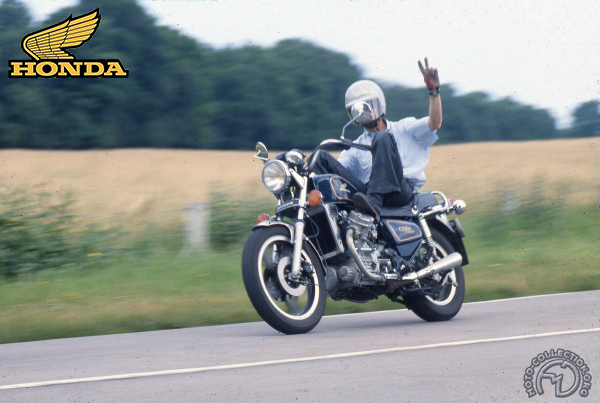 During the Eighties a new, more laid-back style of motorcycle appeared: the "Custom." This category would gnaw away at existing market sectors and become one of the most popular. Up to the end of the Seventies, road-going motorcycles were divided into three basic categories: touring, utility, or sports. This rational classification had become outmoded by 1980. Sports bikes had developed into exclusive super sports models, replicas of competition motorcycles. The market for Grand Touring machines was in decline while the term "utility" had acquired a very down-marker image. The buying public wanted worthwhile, luxurious products. One of the ways the factories responded to this demand was the introduction of the custom category: luxurious utility bikes which were pleasant to ride and had a fashionably shocking image. Since the aesthetics of its compact transverse V-Twin lent themselves admirably to this fashion, Honda got on the bandwagon in 1979 with a Custom version of its excellent 500 CX tourer. The transformation began with big cow-horn handlebars, a tiny teardrop fuel tank, an oversize rear tire and lots of extra chrome. Adorned in this manner, the CX was slower hut just as comfortable and pleasant to ride, with an engine that was both silent and flexible, and possessed an excellent shaft final drive. The GX Custom was the most comfortable and the most roadworthy motorcycle in its category.